The world's largest handset manufacturer, Nokia, is prepping its long-awaited application store for mobile devices at the end of May. With the new service, which is called the Ovi Store, the Finnish company will try to emulate Apple's success -- only with more than 20,000 titles at launch. The Ovi Store, expected for a few months now, will debut with a large catalog of items, unlike Apple, RIM and Google, whose stores launched with a few hundred apps and a few dozen respectively. At the moment, Apple's App Store has just counted 40,000 applications since its launch ten months ago, according to reports today. Nokia's Ovi Store will be preloaded on the N97 model, the company's upcoming flagship model featuring a touchscreen and a QWERTY keyboard. The store will also come on future phones. 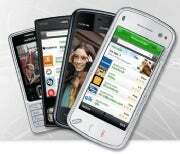 Current Nokia phone users will be able to download the Ovi Store app online and load it on their handsets. But don't be fooled by the five-digit number of content on Nokia's upcoming Ovi Store. The store will contain 20,000 titles -- which means that only a fraction of those will be applications, the rest being multimedia content such as short videos, audio files, and other entertainment clips. However, Nokia's app store will bring a few interesting concepts. The company says the Ovi Store will use the GPS chips (present in most new Nokia phones) to find and recommend content based on the users' location. Ovi Store will also be used as a distribution platform for new firmware releases, and of course, updates to already installed software.